By Kayzee, September 11, 2012 in Completed Scripts/Plugins/etc. Yeah, one of the reasons I made this is because I like to bump the resolution up to 640x480 and the preview becomes kinda useless... unless that is what that second arrow is for. I donno. 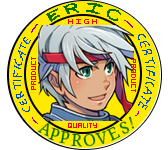 Even so, I still maintain this is something they should have coded into the original RPG Maker VX Ace code. I have no idea what to do could someone help me up ? Are you sure your using RPG Maker VX ace? That is a built in method... maybe your not putting the script bellow the materials thingy in he script list? This is incredibly useful! Thanks for making it! It doesn't seem to process the new escape characters though, is this a bug? I've put a breakpoint in your "process_escape_character" but it's never triggered. I try different escape characters, and nothing happens. What do you mean by breakpoint? You mean like raising an exception? Anyway, it works for me. Are you using any other scripts that add escape characters? Maybe you need to put my script under them. Also it should be noted that a rather unfortunate but kind of unavoidable side effect of how escape sequences work is that you can't follow them with any letters. So "Blah\br Blah" will work "Blah\brBlah" will not. I made the collapsing whitespace mostly to get around some of that problem. So I have an issue that might be due to the combination of this script and EST Notebook System, possibly with the factor of a custom font thrown in. How to create an intro screen. How to make a character creation screen. How to use the map system. How to create a quest. How to create a combat scene. How to create a shop. It looks like that script uses it's own code for drawing the text that is incompatible with my word wrapping script. It draws text line by line and processes it differently so word wrapping doesnâ€™t work. But it does though. I mean, WW clearly affects the text. The commands like /nw in the text file do affect the way it's displayed and if I delete WW script it's displayed differently (without automatic line breaks). So is there a way to make them compatible (or I should say "can you think of a way")? I mean, I could just use /nw for the text files, but your plugin is extremely useful since manually putting linebreaks is just silly for any modern product. I can't think of any way to fix it without rewriting large chunks of the notebook script, and probably dropping lots of features like alignment. Edit: There may be other scripts that do something similar that may work though! I wish I could help you more in this regard. Oh there you are \n. Oh there you are Player1. That's because whitespace converts the newline you put after the /br into a space. You should set collapse to true if you want to use /br like that. Actually you pretty much have to because of how the control codes work unfortunately. I think you don't need /nw. You could just press enter and write it to next line in txt files. And it should write below it. Bit inconvinience but that means full compatibility with any font size / add any pictures. And killozappit is right. I do use my own way to write the text. Which can draw escape codes + alignment (by default... if you use draw_text_ex, you cannot align the text to center but you can draw icon, etc... If you use regular draw_text you can align to center but you cannot draw icon, etc...). Ok I solved that little problem by setting the collapse to true and when it has processed that word then set it to default again. I have a request though. When there is too much text in a text box it will create a new message window, that means if all your text boxes has too much text in them then every second text box will be like 3 words. To solve this you might put the text into the next text box instead of creating a new one, then that text will push the message box's text out and so on and more text will hoard up, then at last when the text session is done for that face you can put the last text into new text boxes. That would be pretty awesome. I am not sure what you mean... you mean putting it in the next message event? 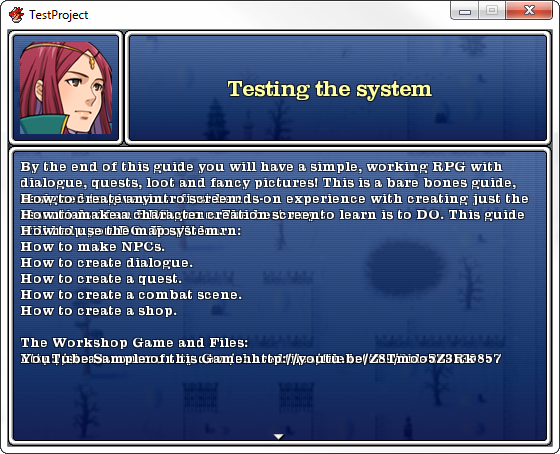 Sorry I haven't been able to use RPG Maker VX Ace for a while (since my harddrive crashed and I basically had to install Linux because I use a refurbished laptop and it didn't come with a windows disc), but I thought you could mark message events as continuous and combine a bunch into one message string already. Anyway, I purposely avoid doing too much manipulation of the window or event system for compatibility reasons, I think that might be the kind of thing that is best done in another script. Yeah, I thought there was a way to combine consecutive message boxes already... Maybe it's a side effect of this script that I am thinking about. That script certainly relies on consecutive message boxes to do large message boxes. Anyway like I said I can't really work on it right now myself and I think that would fall outside the scope of my script. I have a lot dialogue in my game so the lack of word wrapping is extremely annoying! That being said, I believe you should receive a Nobel Prize for solving this problem. Those arrows are actually rather loose alignment guides more then anything else, and are completely useless if you change the resolution.